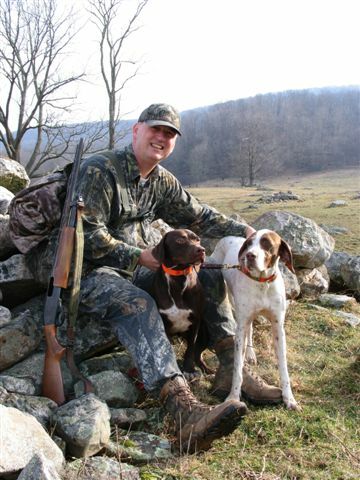 "I live in West Virginia, have been a hunter my whole life, and have ran turkey dogs for many years. 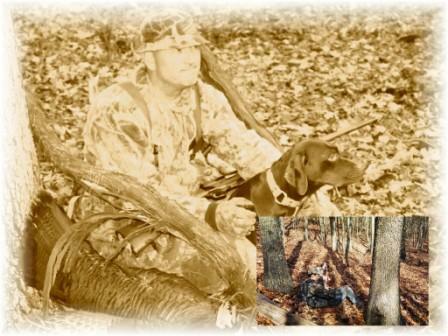 The man that introduced me to this wonderful sport is my hunting buddy, and the best fall turkey hunter that I know. He has forgotten more about turkeys and dogs than most of us will ever know. He wants absolutely no recognition for this, so don't even ask me who it is. He gave me my big dog Patch, and I sometimes think she is the best dog I will ever have. I will just leave it at that, except for thanks 'ol Bud. I used to get mad, now I just laugh when I read about some expert going on about turkey dogs, and why this should not be allowed. Where some people come up with their ideas is beyond me. I have spring hunted for years, but people either have forgotten, or never knew that the fall hunt has a much, much longer tradition than the spring. You see folks; it is the spring hunting that sells all the calls, all the camo, and all the other goodies. But as they say, I digress, this is about our canine buds, not spring and fall. I will say one more thing, the fall hunt will never be as popular as the spring (fine by me!) because plain and simple, the fall hunt is A LOT more work. Mostly a lot more walking than most of today’s hunters want to do. Also in case you haven't noticed, the turkey is not sitting out there on a limb telling the world where he is! We hunt a lot of National Forest here, and it is usually big, big country. 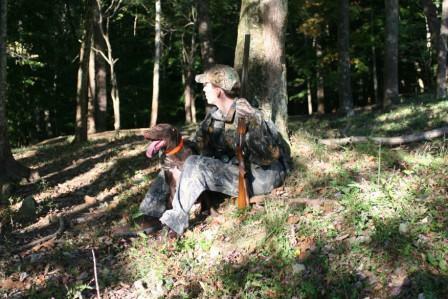 This kind of hunting is intimidating to some people, but it is what we like. As my buddy calls it, "running a dog in big country." It is hard to explain. I think it is like Bluegrass music, you either like it, or you don't. This type of hunting requires a good pair of boots and the ability not to worry too much if you don't make it out till after dark. We also like a dog that is not under our feet. 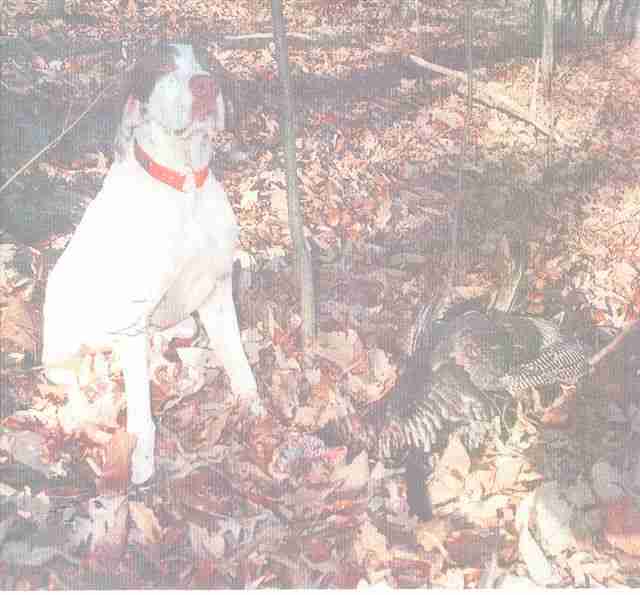 My dog Patch hunts too wide for some folks, sometimes too wide for me, but she does find a turkey once in awhile. My dog Kota is young, and she has the potential to do big things. The origin of the turkey dog was a quail dog that did not want to point. If she also wanted to bark when she flushed, then you really had something. We always blind break our dogs, as we want them with us when we're calling, and because we aren't going back to the truck when we're a mile away. 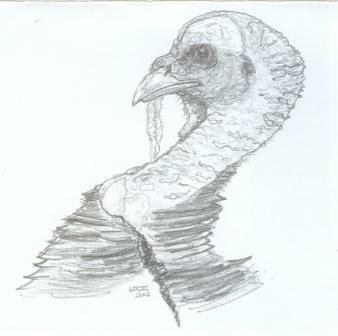 I think this site is interesting, and should do a good job of keeping turkey dog people in communication with one another, which should benefit us all. If anyone wants to talk about dogs, please send an email. As to any of the opinions expressed here, I really don't care to discuss them. But in the words of Col. Kelly, I would be perfectly willing to fight about them." 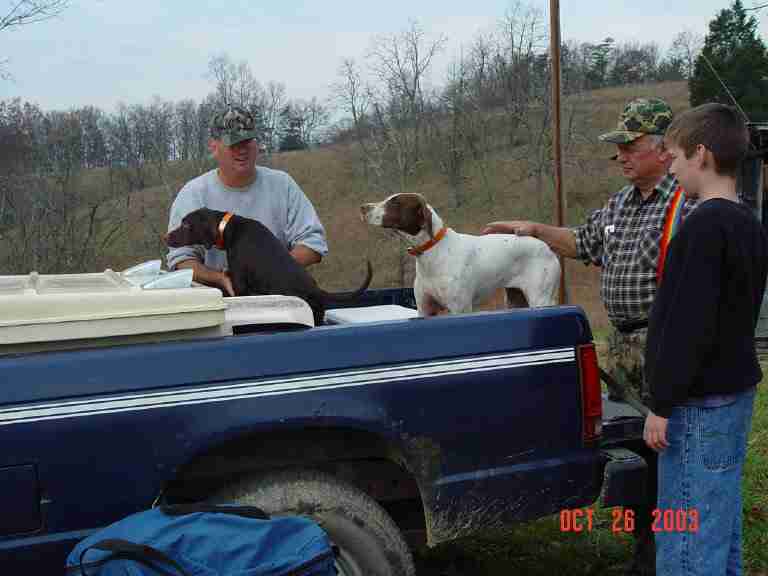 Larry Case, WV DNR Law Enforcement Section, Conservation Officer, Lieutenant. 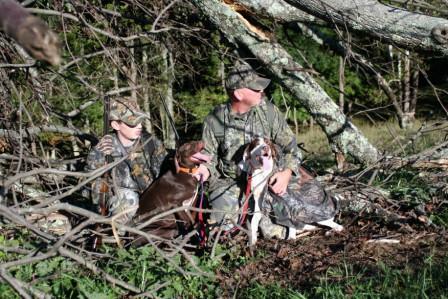 "Pictures with my Dad and Son with our white pointer Patches, and our brown pointer cross Kota." Click on pictures to enlarge. 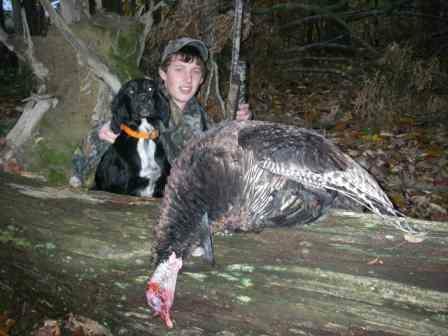 "Patch, Jesse and his first turkey! 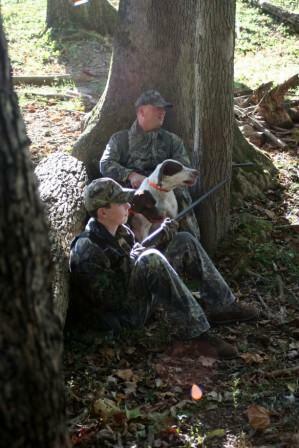 On the last day of the fall season in Greenbrier County, WV, Jesse was 10 years old. 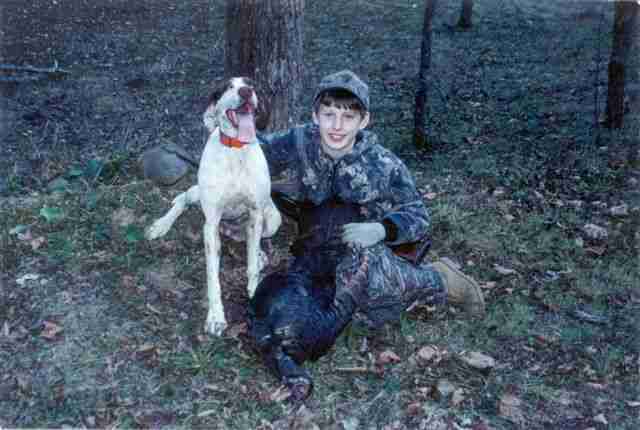 He killed this jake with a .410 single shot at 12 steps. Patch and I were in the blind of course. If I ever get to kill a Cape Buffalo, I assure you it will be no more exciting than this. All the planets lined up this day. Patch put up a good bunch of 12 to 15 birds. I did some calling, and we could hear this jake walking in the dry leaves. He'd yelp back, and finally came into the small clearing. When his head cleared a little mound, I kept whispering 'shoot'. Jesse spent a long time making sure the sites were lined up. When he finally fired it was so on the mark, the bird never twitched. 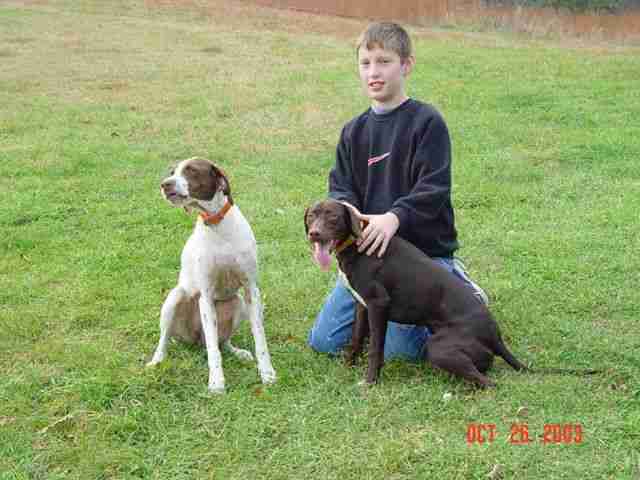 I am very proud of that boy and our dog!!" Jesse and I were in Outdoor Life in the December-January 2005/06 issue. Jesse wrote an article which they printed. It has a picture of us and the dogs. It's in the “young hunter” feature. Case Natural Hellgramites, Lil’ Hellgie, Super Salty, and Dyn-o-mite Stix. Smallmouth bass love them!